Suicide - a rational option under certain circumstances? Yesterday, as I ran 18 miles and had nearly four hours to keep my mind occupied in various ways, one of the topics I spent considerable amount of time on was about "Suicide being a rational option under certain circumstances". The train of thought on Suicide was triggered by the following quote I had read a day or two earlier in Ben Casnocha's recent blog post about the death of David Foster Wallace. I'm wondering whether, as one friend put it to me, a brilliant mind knows that suicide is actually a rational option under certain circumstances. What really hooked me about the above quote was the fact that there was a time when I would have fully agreed with the statement, and that I am in total opposition of it now. While I have not taken active steps towards committing suicide at any point in my life, there have been numerous occasions when depression has taken over my being, I have come close to ending it all, being totally hopeless about life at that point in time. There was also an incident a few years ago when one of my friends committed suicide, and I was left with a regret that if only I had been more open to him and willing to support him in his troubled times he would have not killed himself. In my case, I kind of have an idea how I got to where I was. Early experiences of angry and violent outbursts, and perceived lack of love and appreciation made me withdraw into myself; make up the story that no one can be trusted; that I am ugly, unlovable, dumb, hated, and incompetent; that I am a burden on people around me, and that people barely tolerate my presence. While I went on to have a "successful life" - doing well in education and career, the flawed self-image showed up frequently as depressive episodes, and I made it through life, perfecting the art of being lonely and orphaned despite being with family and friends. While my early mental make up did not allow me to let any human into my life in anyway, my love (and implicit trust) of books turned out to be a redeeming aspect. I have trusted in books wholeheartedly to help me enjoy and live my life. I also turned to books when it became clear to me that who I had turned out to be was not working for me, and that I had to fix myself before something drastic happens. Around 5 or 6 years ago, I was devouring books on various topics related to depression, personality disorders, psychotherapy, etc. A direct off-shoot of this bibliographical excursion was the decision to seek psychotherapy counseling. Given my total lack of trust in fellow human beings, and the total trust in books, it is no surprise that I started my psychotherapy sessions with an author of one of the books I read ;-). One of the literary gems I came across in my attempt to find some book to help me in my efforts is William Styron's Darkness Visible : A memoir of madness. From my previous post about this book : "William Styron was not only able to express very lucidly the hopelessness and maddening frustrations of his increasingly melancholic state-of-mind, but also delves in length on the recovery aspects, starting with his recollection of the happier times of his life on listening to a favourite piece of music." The movie Girl, Interrupted reinforced my belief in the benefits of psychotherapy, clarifying what I was out to get for myself from these expensive sessions. The psychotherapy sessions did make a huge difference. In short, these long years of therapy helped me reactivate my emotional sensors and be with what is happening in the world. I am eternally grateful for the work my psychotherapist guided me through to undo the sinister parts of my mental make-up. In my monotonous and dreary existence over the past few years - sustained by regular dose of therapeutic counseling (and towards the later part through prescription anti-depressants), the single most joyful experience I have been lucky to have had is to be at the receiving end of unconditional love from many kids - my nieces and nephews, the kids of many of my friends. I hold fond memories particularly of the time I spent with my Baltimore friends' two kids - being part of THEIR growing up process, and knowing that they love me for just being myself, seems to have in some way made me give up a huge slice of the "I am unlovable" crap I had been holding on to for all my life! I took up running almost two years ago to the date, running my first 5K race on Sunday Oct 08, 2006. Now as I prepare to run my first marathon on Nov 23rd, I am present to how much of a life force rejuvenatory thing this habit has been. The pride and joy I got every time I met a personal milestone in running has added to my personal confidence by leaps and bounds. When a person genuinely loves himself and is proud of his accomplishments, say good-bye to depression! The definite shift towards vitality and eager anticipation for all that life has to offer occurred over the three and half days of the Landmark Forum that I attended last June. The Landmark Forum allowed me let go of all the "shoulds", "musts" &"can'ts" that have been making my life miserable, and has given me faith in my ability to fully participate in and enjoy life to the fullest! There was a time when I would have considered suicide a rational option, but that was in the past!! Now I am clear that life is worth living, and that suicide is an option only for people limited in their ability to receive and give love! The India Positive blog is an amazing collection of good things about India. Something I would have loved to have written! I came across this blog while looking for blogspot.com blogs that mention Dr. Ashis Roy. Surprised to see someone has already put in the effort to highlight the positive aspects of India in an organized manner on a web log - easily accessible for anyone with internet connection. I would love to meet up with Venkatesh Kanna - the author of this blog. Wonder why he has become less active in 2008 - with only one entry so far, after having 304 and 194 posts in 2006 and 2007 respectively. Met with Dr. Ashis Roy yesterday in Washington DC, where he is staying with his daughter's family on his visit to US. Delhi based Dr. Roy is one of a kind! 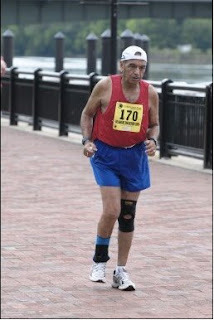 He is 75 years old and has completed 82 marathons so far, and has plans to notch up the hundred mark before he is 80! His next marathon will be at the Grandma's Marathon in Duluth, Minnesota on Saturday June 22nd. When Indian nationals are a rare sighting at even a 5K or a 10K in the US, Dr. Roy's feat of completing 82 marathons seems totally out of this world! I had come across his name in a newspaper article about his completion of the 82nd Marathon recently at the Delaware marathon. I contacted the author of the article to get Dr. Roy's contact information, and wrote to him last week. After a couple of phone conversations and email exchanges, we set up a "running date" this past Sunday. It was a pleasure running with Dr. Roy. We had a long conversation about his life, the various marathons he has run, his experience at those Marathons, and about good running practices. He has been a runner all his life, growing up in Shillong, Meghalaya, running and walking to faraway school from early age. He was a Ranji level Cricket player in his youth. He had joined the Indian Air force in 1957 with am ambition to represent India in long distance running at the Olympics. The plans to represent India in the 10,000m race at the 1960 Rome Olympics failed to materialize as work pressures took over. After retiring from the Air Force as a Wing Commander in 1978, Dr. Roy started a private practice in Delhi, and had gained a lot of weight over the next few years. A chance encounter with an ex-colleague who could not recognize Dr. Roy with all the weight he had gained, made Dr. Roy to take up regular running as a physical exercise to reduce weight. He ran his first marathon two years later, and has been going from strength to strength ever since. Run slower and longer; taking a walking break breaks the rhythm and the warmth of the body. I ran 6 miles with him in 1 hour 19 minutes at a slower pace than usual and ended the run very strongly, feeling very comfortable. It is advisable not to spit out saliva and instead to swallow it. Saliva is the fluid content in our body and we need to conserve it, not throw away. Good running shoes - which provide good cushioning to the sole with Gel - are mandatory for long running career. A total newcomer to long distance running is advised to run 5Ks and 10Ks for the first two years, and go for a couple of half-marathons before attempting the first marathon. I am right on track to follow this advice, having competed in a few 5Ks over the past three years, and now training for the first half-marathon in July. My first marathon might be at the end of this year. Or early next year. The run should be preceded and followed by a good stretching work-out. When we ran yesterday, we stretched for a couple of minutes before the start, and spent around 15 minutes stretching after the end. One advice to me and to the many Indians (and non-Indians) who have bellies of various sizes: Make sit-ups a standard part of your work out. He does a 100 sit-ups everyday as part of his training. That is the key to get rid of the belly fat! Rather surprisingly, Dr. Roy swears by Indian Vegetarian food! On my drive back from DC yesterday after meeting with Dr. Ashis Roy, I took the long way back and stopped over at the Gettysburg National Military Park - a place I wanted to visit for long. Having learned about the Civil war during the road trip with Jon Hoffman last summer, and having visited the Vicksburg National Military Park during the same road trip, I was very keep to visit Gettysburg - a must see place for a Civil War buff! It is appropriate that I visited Gettysburg at this juncture when I am questioning my commitments - or the lack of commitment. Hoping that President Lincoln's invitation "........ It is for us, the living, rather to be dedicated here to the unfinished work....." as part of the Gettysburg address to inspire me to dedicate myself to my unfinished work and commitments. The theme emphasized many times at the Gettysburg National Park is "A New Birth of Freedom" - taking a piece off Lincoln's address at Gettysburg. It is an apt description of Gettysburg's role - or for that matter, the Civil War's role - in American history. It can also serve as an apt metaphor for a periodic rebirth on a personal scale - an instance of one such periodic rebirth I have been engaged in at the moment. 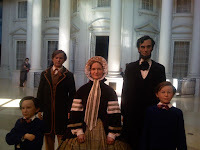 The History Channel movie, the museum exhibits, the walk through the Cemetery, the Soldier's National Cemetery monument where Lincoln stood while he delivered the Gettysburg Address, the monuments to the thousands of soldiers who fought and died at the Gettysburg battle - all are quite inspirational! Took a few photos with my iPhone; check them out at the Gettysburg Visit Set on my Flickr Account. 2 year old Arpita was having a ball of a time with Mana Mana video and a few other kids' videos the other day when I was visiting Amrit's place. Here I am compiling a list of such videos - for the benefit of kids and young-at-heart everywhere. A warning : The music in these videos will get stuck in ones mind very easily! Finally got around to write about the Day Long Seminar with Seth Godin I was at more than two weeks ago. It was a very impressive day; as I was telling my friends at Landmark, this Seminar was like Landmark Forum for Businesses - cutting through the filters and blindspots of the business people who had come to the Seminar. One had to be there to get the juicy stuff!! Here in this post, I will try to list out a few fringe benefits that I got out of the seminar. First and foremost, I got an All Marketers Are Liars NOSE !! Actually I did not get it; I took it from the guy who got it as he did not want it. Seth riffed on the RunWalkIndia web-site and the business model of the company and that has given me quite a bit to work with. More about this on the RunWalkIndia blog. Basecamp : Web based Project management, collaboration, and task software. Woot.com : An eccentric web-site selling only one item per day! BatchBook : Small business CRM; one of the fellow participant's company. KidZui - Internet for kids; a co-participant's business. Place where all the kids are hanging out Club Penguin! Dating sites : Plenty of Fish and Date a Golfer. A SEO business site(?) from a fellow participant from Denmark. Don't you love the look of this site? Have people change their desk - bag baggage and all - to a new desk at work on a regular basis. It is a simple and effective way to have people be adjusted to constant change. Ain't that simple and insightful?! Heard this anecdote from a Landmark Forum Leader a while ago and it has been on my mind for a while as a perfect item for my Stories Blog. Incidentally for those who don't know what the blog name is all about : Kathegalu is Stories in Kannada - my mother tongue. Back to the story of eating one's fish. A chinese American woman was at the Landmark Forum, and was venting her anger towards her mother. Her mother - among other things - had been annoying her for years by saying "Don't forget to eat your fish today" every day as her daughter walked out of the door. After sorting out all the other complaints the woman had towards her mother, the Landmark Forum Leader said to her "Do you realize asking you to eat fish is the way your mother shows her love towards you?" The woman was stumped but got what it meant. She went back home and the next time her mother said "Don't forget to eat your fish today", she went over to her mother and hugged her telling "Thank you for loving me so much". Brings tears to my eyes whenever I remember that story. Is there anyone in your life who is reminding you to eat your fish and you are not seeing the underlying deep love? I am immensely gratified to note that I have transformed myself to a Gadget Geek over the past couple of years after being afraid of new gadgets or any kind of hardware for long. To let you in on a secret, I haven't yet touched a Gameboy or a XBox or any gaming console yet! I wrote about being a pioneer in adopting iPhone as a personal 'machine' around a year ago. Now that I realize what a Gadget-Freak I have become, I will take it upon myself to write about some of the gadgets that are employed in making my life fuller and richer. Today, I want to talk about the Bose QuietComfort 3 Acoustic Noise Cancelling Headphones. As usual it took me a while to put the gadget into use from the time I bought it. In this case it took almost a month! The Headphones were surprisingly easy to figure out and include it's management & maintenance in my regular life. And it has been awesome to use. The noise canceling feature is incredible - even without switching on the headphones, I just have to put on the headphones to avail myself of some quiet time where ever I am. The music on my iPhone is sweeter with these headphones. I am one of the few people who have these expensive headphones on in the PATH trains and the NYC Subways. A bonus feature I found out after I bought the headphones is that it works as a surprisingly good phone head-set as well! I have been using it to speak over the phone while driving. Makes me wonder if I wasted my money buying a bluetooth headset. More about that later - after I figure out how to use the bluetooth headset. I have always wanted to be my own boss, and over the past year or so have transformed my life from a regular office worker to a Serial Entrepreneur - with one venture RunWalkIndia off the starting block, and another - in the Trading & Risk Management Software area - in the works. I wonder how many in my circle are having ambitions of starting an own business but are not doing anything about it. In the face of uncertainty, it seems to me that the very worst thing you can do is fail to try. I went to business school at Standord, which prides itself on being very entrepreneurial. Of the 300 people in my class, at least half publicly proclaimed that they were going to start their own businesses sooner or later. Now, 20 years later, only about 30 of us have actually done it. The rest are still waiting for the right time or the right idea or the right backing. They're waiting for an engraved invitation and some guarantee of success. I am sure quite a few of friends and classmates as well are in the same boat and waiting for something. I myself was in similar situation till early last year, and have tread a different path in the last few months to be where I am now. This post is for those Entrepreneurs-in-hiding in my circle (MBA class mates, Engineering classmates, Colleagues from various organizations I have worked with, my family,....), and in this post I aim to give a bullet-point list to help them move towards Entrepreneurship. Participate in The Landmark Forum : Landmark Education's flagship program The Landmark Forum is rated #2 on the list of Top 100 Adventures at the Top 100 Expo web-site. This program jump-started my entrepreneurial adventures when I attended the Forum in June 2007, having been driven to it by pain and anguish caused by a personal tragedy. Some Independent research, Case Studies, and Surveys have highlighted the value Landmark Forum brings into the life of each of the participants. Personally, I got the courage to take control of my career after attending the Forum, and subsequently have achieved immense breakthroughs in many aspects of my life through my continued association with Landmark Education. My advice to anyone who wants to do something and feel stuck or not ready : "Attend the Landmark Forum!! You will start seeing the world in a whole new light! Read Ben Casnocha's book My Start-up Life and his blog : I came across Ben's book shortly after participating in the Landmark Forum, and when I was searching - with perfect clarity - for some book to help me start up my own business. I doubt if I could have picked up a better book this this one : Written by a guy who started a business when he was 13 years old!! And that too in the similar space I was considering a new business in. Ben is very articulate and provides an engaging and informational story of how he came about starting a company at such a young age. Ben's Blog too is a treasure trove of valuable advice for entrepreneurs as well. And if you need advice about something, write to Ben - he gets back to you with a valued answer with a very quick turn-around! Read up Rajesh Setty's Blog; the blog post titled Blast from the Past - Entrepreneur Pack is a gem. View Guy Kawasaki's The Art of the Start video; then buy a copy of Guy Kawasaki's The Art of the Start and keep it by your bed-side, and read it up from end to end a few times! Read up Guy Kawasaki's funny and insightful blog entries regularly. Read up anything written by Seth Godin that you can get your hands on. Seth's Blog constantly send me "Wow, why didn't I think of it" or "Sooooo Simple!!". All of Seth Godin's books are a must for anyone starting an own business. The now out-of-print The Bootstrapper's Bible is another mandatory bed-side book for a budding entrepreneur, what with a byline which goes How to Start and Build a Business with a Great Idea and (Almost) No Money. After reading some of the above, you are ready to go! Go out and start your own business and have a ball of a time while doing it! Economic growth is desirable for all countries because it improves the material standard of living and spawns moral benefits, i.e. it “fosters greater opportunity, tolerance of diversity, social mobility, commitment to fairness, and dedication to democracy.” Of the various causes of economic growth, I believe one value is paramount: entrepreneurship. Finally got the courage to aim for completing a marathon. And have zeroed in on running my first marathon at the 2008 Self-Transcendence Marathon on Friday Aug 22nd at the Rockland Lake State Park - close to Nyack, New York. I am moving beyond the 5K and 10K races I was aiming to complete - and be happy - for the past couple of years, and going for the GOLD! The 26.2 miles gold standard of running!!! And why wouldn't I do it? I can have everything I want!! People in my circle have been of great inspiration in my effort to build on my 'running' successes. My friend and colleague - Elodie Jabaud-Hampton - completed a Half-marathon for the first time at the More Magazine Half-Marathon in New York City recently; going through a gruelling training regime for the past few months! Another friend Dr Rajat Chauhan keeps going on a marathon run at the drop of a hat, having recently completed five marathons on consecutive days in the heat of the Thar Desert in Rajasthan, and running up Nandi Hills almost every week-end. A few crazy people I know in Bangalore are eagerly waiting for November 16th, 2008 to spread their wings wide and compete in the Bangalore Ultra Marathon. Another friend Rahul Verghese of RunningAndLiving is running at the Great Ocean Road Marathon in Australia this week-end, in an attempt to join the Seven Continents Club. That reminds me of a side note : My company RunWalkIndia - will be sponsoring Rahul Verghese's participation in the Antarctic Marathon Run in 2010/2011. With so many marathoners in my circle, any surprise I have succumbed to the temptation to run a marathon myself? I have a little less than 15 weeks till Aug 22nd. 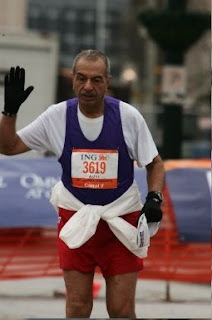 I am starting on a customized version of the 18 week Novice program Marathon training schedule provided by Hal Higdon. Complete the distance. No attempt to break the World Record! Find out for myself how far I can stretch myself! Everybody wants it. Nobody understands it. Money is the great taboo. People just won't talk about it. And that is what leads you to sub-prime. Take the greed and the financial representation out of it, and the root of this crisis is massive levels of financial illiteracy. The following quotes by Mahatma Gandhi were displayed at the National Civil Rights Museum in Memphis - a museum which is housed in Lorraine Hotel where Martin Luther King Jr. was felled by an assassin's bullet. It has always been a mystery to me, how men can feel themselves honored by the humiliation of their fellow beings. If you want to cultivate a true spirit of democracy, we cannot afford to be intolerant. Intolerance betrays want of faith in one's cause. Some of my friends in New York were very moved when they read these; that surprised me as I wasn't all that moved with these quotes, and were taking them sort of for granted. Made me wonder if I and my fellow Indians are saturated with Gandhian-isms that we don't appreciate what he stood for. If it is your funeral today, what your friends and family will be remembering, and miss the most is YOU - not what you have not done or have left incomplete. That is an amazing way of looking at our never-ending to-do list. A reminder for us to be who we are, and not get swamped and swayed by the things we are doing / not doing. I made a few calls earlier yesterday to inquire if any of the toy stores in my neighborhood in NJ have Rubik's' Cube. A couple of Toysrus outlets mentioned they don't have it. Then I remembered the last time I bought a Cube was at the K B Toys store in Manhattan mall. Googled to get the contact number for one K B Toys store near Bridgewater, NJ. On calling the 908 number I got, an automated message informed me that the number has changed to a toll free 888 number. I was appreciative of the fact that K B Toys - a nation-wide chain store was switching to a common toll free number instead of one local number for every store. Had no patience to pursue it further in any other K B Toys. On a hunch that WalMart has everything, I drove over to the local WalMart, picked up a couple of Rubik's Cubes and went happily to visit my friend. Yes, pick up that piece of garbage off the street and put it in a Garbage can. What better way is there to immediately contribute to a better world. On one of the days I was in Bangalore and was visiting the Jayaprakash Narayan Park, I started picking up glass bottles, plastic covers and other trash dumped in the park - collect them in a bag and threw the bag into a garbage can. Kumar's 5 year old daughter Bhavana accompanied me on this adventure repeating what I said once : "People don't have sense", and picking up stuff herself and pointing me to other pieces of trash. At the end of half and hour, we had quite a collection. More than the physical items we collected, what really impressed me was how quickly Bhavana got it, and got into the game. It is no surprise kids are much easier to transform. With the intention of raising awareness about keeping the park clean and taking pride in doing so, we are organizing a Namma Park JP Park Run (Our Park JP Park Run) on Sunday May 4th. Along with a Kids dash and a 1K walk / run for the elderly people, we will have a cleanliness drive, where people will go around the park with a bag in hand collecting trash items. I am pained to see the same kind of apathy and lack of pride in our surroundings pervading the area where I live in Jersey City. Now whenever I see a piece of garbage while walking in my neighborhood, I pick that piece of garbage off the road and move it to where it belongs - a trash can. Hopefully that will inspire others to clean up after them as well and make it to a cleaner neighborhood. I wonder if there is an easier way to contribute to a better world. My first Entrepreneurial venture takes flight! Register yourself by calling the phone numbers in the flier. Tell your friends. Tell your neighbors. Tell your family. Get all of them to register. Run in the 5K race. Register your kids, and let them have fun in the kids' dash. Let the entire family participate in a fitness oriented fun event, and help in making the community healthier and fitter! Advertising on the Moon through Laser projections!! Rolling Rock Beer Company based in St. Louis is onto this new venture called Moonvertising. It will no doubt cause a huge uproar everywhere in the world if and when Moon will be used as a big advertising billboard. I for one would like to enjoy the peace and dull illumination of the full-moon night without having to ignore the sales pitch coming along with the moon rays. Perhaps those were-wolves who turn from men to wolves on Full moon day will be happy with this development. Maybe it will keep them permanently as wolves! I have signed up for the A day with Seth Godin event being held in New York City on April 30th. Excited about it! The event price is $2000, and all of it goes to charity (Acumen Fund) ; so effectively I will be getting to spend a day with Seth Godin for free, after making a minor dent in making the world better though my contribution to Acumen Fund! I came across Seth Godin's name - many times - a few months ago, in my efforts to learn more about starting out on my own. His name kept popping up so frequently that I had to read more about him and by him. Seth's writing is direct, up to the point, insightful and very relevant. His blog is a repository of pithy business & marketing wisdom. What really captured my imagination about Seth's writing was his comprehensive guide on starting up a business with little or no money - The Bootstrapper's Bible. You're going to be running this business a long time. Spend an extra month to figure out what your business model feels like and save yourself some headaches later. With a business model that works, the deal is simple. You invest time, effort, and money. In return, your market responds with sales, cash flow, and profits. A business model is a machine, a method, a plan for extracting money from a system. Most people hate to be wrong. Starting a business is the most public, most expensive, riskiest way of all to be wrong. Without money, there is no business. Run out of money and your creditors will shut you down, your employees will leave, and your spouse will worry. Here's my best advice for you: Stop planning and start doing. You don't have to quit your day job. But you do have to get out there and do it. The more you do, the more you do. Doors will open. Opportunities will appear. Your model will change, your reputation will increase, you will become a magnet for smart people, good customers, and investors. But none of this will happen if you stay inside and keep planning. Build your business. One day at a time, one customer at a time. Lower your downsides, focus on the upsides, and start building. But start. Revenue is revenue when you see the money. Expenses are expenses when you pay the money. Cash is king and that's what you keep track of. After entering my details on the Squidoo Lens with the list of people who will be attending the Seminar, I regretted not putting a link for everyone to learn more about me in this post. On Googling for my name, I was thrilled to see my blog come up as the first hit!! I must have been doing somethings right if I get a top hit despite not learning much about Search Engine Optimization techniques!! Should I continue with the Introduction Leaders Program at Landmark Education? Or should I drop out in the interest of having more time to dedicate to my other more important & demanding priorities - mainly my entrepreneurship venture? Can I do it now, when I am taking on a highly unstructured life-style with plans of starting a business on my own - as early as April 1st? ILP will be a good way to continue my association with Landmark, and benefit from the nurturing and positive environment at Landmark. An unrelated mail from my father yesterday further emphasizes the value of Landmark Education Courses in my life, all but sealing the decision. I want to be the instrument of transformation through Landmark, and why shouldn't I continue in the effort by being in ILP now? The intense time demands of the course is what is making it difficult for me to decide on participating now; the fact that I could continue with the course in Bangalore and Denver (should I move there for the Summer) adding another argument in favor of continuing now. ILP is a demanding course: Over the next six months till Oct 3rd 2008, I will have to commit two evenings per week, four full week-ends, some additional time to do the assignments, and quite likely some more time for the socializing around Landmark and the course. The next few months are going to be crazy with my life taking a steep trajectory in an unknown direction. And it is better spent with the structure provided by ILP and the support, motivation & encouragement I can get from the course-mates, and having the satisfaction of working towards an important personal goal, rather than be weighed down with a regret of what could have been or would have been. It is going to be challenging, and I am up to the challenge! I am the master of my life. I choose to be in the Introduction Leaders Program. At the end of this course, I am sure I will be better skilled at managing my time, and wondering what the fuss was all about at the beginning. I visited Boulder, CO to attend the TechStars for a Day event on Wednesday. The decision to attend this event was a last minute one - I decided on Sunday evening that I am going for sure; however, deciding to go was a no brainer. Think Ben Casnocha, Shelfari, Brad Feld, Mobius, Rocky Mountains & Tibetian restaurants. The event was fun, quite enjoyable and very useful. Felt good & inspirational to revel in the energy of 50 or 60 young & budding entrepreneurs and a few experienced folks who have been there and done that. Participants had come from as far as UK and Australia! Since I was already sold on the idea of TechStars even before going there, I wasn't really listening keenly during some of the parts where people were on a "TechStars is a gift from God" mode. The first-person accounts of Excite.com and MyBlogLog.com were interesting case-studies of the Entrepreneurship band-wagon, highlighting some of the practical issues faced in the startup years, the personal sacrifices involved in making it big, and the importance and value of team-work & mentoring / outside support and nurturing in the entrepreneurial efforts. The session with the founders from the previous year's TechStars Bootcamp was the highlight of the day for me. Amazing to see a few 'kids' talk about their journey from guys-with-ideas to founders of startups with funding - and a product - to show for the effort! Got to speak with a few of the other participants about their business ideas. One guy - from Mexico - is already way ahead in the startup game with his company : Shastic! Another person I met had an idea of having restaurants in his home city to put up their menus on the web and allow for patrons to place an order through the web-application. I told him about the Seamlessweb web-site which I have been using to order my lunch in New York City for the past few weeks. I might have made him rethink his business plans! It is still a mystery to me how an idea grows into a million-dollar - if not a Google-esque Billion-dollar - company, and given that TechStars provides the tools, knowledge, environment, mentoring, seed funding, contacts, legal advice and anything else required to do so, I am bullishly sold on TechStars! Refining the objectives of the business - getting to the nuts and bolts. As Guy Kawasaki says - and TechStars repeatedly emphasizes - to find a soul-mate or two to work with me in this effort; someone who is / are as passionate about the business idea as I am, and who is /are willing to move to Boulder for the period of the boot-camp, should this business idea be selected for the boot camp. Regardless of whether I am in TechStars program or not, I definitely have to find partners to work with on this. The fact that I have found enthusiastic and willing partners in the RunWalkIndia project is a harbinger of good things to come in this business as well! An unexpected by-product of this trip is the contact with Newmerix - which is operating in a very similar business space as I am planning to get into. While they focus on the well-known ERP packages like SAP and PeopleSoft, I am planning to focus on a less well-known and a too-often not-identified-as-an-Enterprise-wide-application package: Murex. While I was not able to visit their offices and meet them in person (as I would have preferred), I did speak with the person who is working as a VP of marketing at Newmerix, and got some valuable feedback about the business. One thing to work on later: To replicate the TechStars bootcamp program in India, in some favorable location(s). Boulder is a favorable location because of its strong local business culture, University town ambiance with a few Nobel Laureates to boast about, proximity to Denver, etc. Wonder if Bangalore or Mysore or Pune or any other Indian city will have similar factors to make for successful entrepreneurship culture. I did more digging into the www over the past few days, and my mood has improved considerably with what I have found! Srinivasa Rao informed me about Vikram Akula, and about him being threatened by local money lenders' mafia. Vikram Akula - the founder and CEO of SKS Microfinance - was named in Time Magazine's list of 100 people shaping our world in 2006. Very impressive work by SKS India so far! Using SmartCards to provide MicroLoans makes it a safe transaction, as well as puts in place accountability mechanisms. I wrote to info@sksindia.com mailing address on the SKS Microfinance web-site inquiring about their non-participation as a field partner in Kiva; haven't heard from them yet. I will follow up with my friends in India who are more knowledgeable about this topic later on. Matt Flannery - the co-founder and CEO of Kiva - maintains a blog called Kiva Chronicles on the Social Edge site. Quite interesting to know what is happening behind the scenes at Kiva. Social Edge site gives an immense boost to my spirits and makes me believe in the goodness of Human Beings, as well as in the social awareness & spirit of responsibility among Indians (which I don't have a high opinion of so far). There are quite a few Indian microfinance institutions and individuals high-lighted in the various sections of Social Edge. The blog by Bangalore based Sagar Gubbi is a particular favorite of mine as he talks about the places I am very familiar with, and am very much connected to. Another interesting organization I came across in this journey down the rabbit-hole is ITIHAS and the magazine they publish - Sattva. In addition to being impressed by their efforts towards accelerating social change process, the dual meanings of the organization's name made for a lasting impression. ITIHAS means 'history' in hindi, and the organization spells it as I-think-I-have-a-solution! This is the last post about Microfinance and India in the near future, as I am putting away my effort to dig further into the world of Microfinance in India. I am satisfied there are many able people with deep social conscience working on alleviating poverty in India through various means. Though micro-credit is a way of helping people out of poverty, that alone is certainly (not) enough to deal with poverty. I think the most important option is attitudinal change. Success first begins with having a positive attitude. People ought to be taught and educated on the principles of poverty eradication. More attention should be given to the up and coming generation. Spreading the mantra of Entrepreneurship. 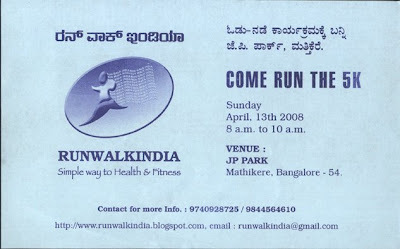 Contributing to the health and well-being of Indians by making running popular in India through Run Walk India. Encouraging self-examination and raising the community awareness through Landmark Education courses. Raising the awareness about the value of Psychotherapy in improving the quality of one's life. Right now, onto my efforts at launching my entrepreneurial career with the trip to Boulder, Colorado to meet with the folks at TechStars! Recently I had a miscommunication with some of my friends where I had assumed to have informed them about something but they had no idea about it. We put the topic to rest by saying that I had told it in my mind. This is not similar situation, but it is very close to being one. I am highly indebted to Ben Casnocha for being a huge inspiration over the past few months since I read his book My Start-up Life. I have talked about him and the book with my friends, on the Shelfari Entrepreneurship group discussions, gifted the book to a few of my friends and recommended it to some more, have been following Ben's blog posts regularly and gained valuable insights, and have been in communication with Ben himself - to thank him for writing the book. I guess it is not a matter of being ungracious that there has been no blog post dedicated to Ben Casnocha on my blog so far. So here is my official thank you note to Ben Casnocha through the Blogosphere. I take this opportunity to elaborate on what appeals me about Ben's books and his blog. My Start-up Life instilled new life into my entrepreneurial ambitions which hitherto were only wishful thinking at best. The book made me believe in my ability to achieve success in business. I am convinced of the value of entrepreneurial spirit in making the world a better place. Ben's accessibility and openness - through the book, the blog, and his speedy & thoughtful responses to personal emails - makes him a trusted 'friend' I have made over the internet. Dear Reader: Fortune or serendipity or bored browsing has brought you to this blogpost; Take it as a sign that the powers-that-be are telling you to go to the nearest book-store and buy yourself a copy of Ben Casnocha's My Start-up Life! Am onto the Facebook bandwagon now - for the past few days. The site is well-structured, user friendly and filled with lots of interesting stuff. Excellent way to keep in touch with friends! On signing up with Facebook, I sent an invite to all of my friends who were on Facebook already (based on my email address book) to add me as their friend. For one of the invites I sent, I got an acceptance from a 16 year old kid in a High school in Brooklyn, to my amusement and surprise. The friend who I had invited was in her 30s; so I was wondering if I had a wrong email ID or had spelled the email ID incorrectly. Both turned out to be negative. On informing my friend about this incident, she confirmed that the kid who had accepted my invitation was her 10 year old son, using her email ID and pretending to be a 16 year old on Facebook, to get around the restriction that only people 13 and older can sign up on Facebook! Hope the kid did not get into too much trouble because I ratted him out. I have taken the next week off from work. I want to spend the 9 days from Mar 1st to Mar 9th on my personal goals, specifically the main goal about starting out on my own in the Trading Software Best Practices Space. I have embarked on a remarkable journey filled with courage, integrity and self-confidence ever since I attended the Landmark Forum course in June last year. I took pro-active steps to address my dissatisfaction at work, went on a road-trip across USA, re-invented myself, bravely made a plan for a spectacular 2008, and made things such that I am much more happy and satisfied about myself. I have been doing well in terms of the progress on each of the items on my plan for a Spectacular 2008; Time to take it up a few more notches! Guy Kawasaki's The Art of the Start, Seth Godin's The Bootstrapper's Bible, and Rajesh Setty's Entrepreneur Pack will be my guides / references in my efforts next week. Given that I won't be starting out with a number of people with deep pockets ready to support me, Bootstrapping Concepts will be of tantamount importance. While the above books and more will be of immense value in my adventure, I will be able to get something out of them only by DOING things. My emphasis should be to come up with actionable items based on the advice in these books and go about accomplishing each of the tasks. Proper due diligence at this stage will ensure I have a decent chance of succeeding in my goals. Set up a Personal Wiki on my desktop / laptop. As part of my effort towards starting up on my own, I have to meet up with / speak with / write to many of my friends and acquaintances in the New York / Financial Technology world. In addition, I also want to get in touch with the next door NJCU Business Development Incubator to build relationships which could facilitate my venture. Next Friday is the first session of the Introduction Leaders Program I have signed up at Landmark Education. At this moment, I am committed to participate fully in the six month course, and complete the course. However, if I find the work-load of the course to be becoming detrimental to my entrepreneurial venture, or if I don't find value in the objectives of the program, I am willing to pull out of the program. The magic week will start off with a dinner with Rebe and end with the four mile run in Central Park as part of the New York Colon Cancer Challenge. In between, I will indulge myself with at least one day on the Ski Slopes. I would no doubt deserve the break after the hard work. This is a first in the series of posts on this blog through which I will be exploring the subject of Micro-finance in India. Micro-finance is an awesome idea; a proven way to alleviate poverty in the world. India is a poor country. Yes, lets not mince words about it. Yes, I know about the booming Indian economy, the impressive GDP growth rate, the IT millionaires & billionaires, the increased level of disposable incomes among the Indian middle-class, the Indian conglomerates' ambitious surge in the world economy, Mukesh Ambani pipping Bill Gates as the richest man in the world, the sky-rocketing prices of real-estate in the Indian Cities, the multi-million dollar bidding game on Cricketers in the Indian Premier League, and so on and so forth. 54 % of the population in India has an annual income of less than Rs. 1000 in 2005, as per this report from McKinsey. This damning statistic alone condemns India as a poor country, in my view. Here is an interesting article exploring the rather different interpretation of the term "Poverty Level" in India. I know about the daily struggles of some of my relatives living in Rural areas of India, and had it not been for some folks in my family-tree taking up education, I too would have been in their ranks today. Given the magnitude of this problem, I expected Micro-finance to be BIG in India. However, I haven't come across any major news - accessible to an irregular reader of CNN international news or the on-line editions of Indian Newspapers - about the growth and impact of Micro-finance in India so far. Kiva - which allows for affluent people to provide 0.0% loans to help (groups of) individuals in need of capital in the poorer countries and neighbourhoods - is a brilliant idea. I was shocked and disappointed to see that there is not a single Micro-finance Institution listed as a Field Partner of Kiva on the Kiva web-site. I would have preferred to help the needy and deserving folks in India, but there are no one from India listed on Kiva! Micro-finance has the potential to promote Money-Laundering; hence it is not being encouraged in India. Corrupt politicians and goons have a stranglehold over Micro-finance industry in India these days. I find it incredible that an idea that is being touted as the best possible way to combat poverty and imbalance of economic opportunities is not a kosher idea in India. A New York Times article by Economist & author Tyler Cowen explains the state of Micro-finance in India. Though the article is from 2006, it is still relevant. I am surprised to learn about the high cost of operating small Micro-finance organizations, and the consequent high-rate of interest charged for the micro-finance loans. This makes the Kiva model even more attractive in the Indian context. At this time, I can only guess about the reasons why very few Indian Micro-finance institutions are listed on MIX Market (only 96 as of Feb 23, 2008, with only a handful of them meeting the highest information disclosure criterion) and not a single one of them is a registered and active Field Partner of Kiva. That is likely to be the topic of my next post in this series. Tyler Cowen's article talks about one Indian MFI - Spandana. The Microcapital.org web-site lists news items about a few Indian MFIs. Guy Kawasaki has an interesting post about PlayPumps - an organization addressing the water problems in Sub-Saharan Africa. An impressive effort at addressing one very critical problem! Far more interesting than the article are the comments made by many readers. Continuing my recent hobby of reading about American history, I started on David McCullough's 1776 last week, and have completed three of the seven chapters so far. The colonies obtained a large supply of cannons and powder, much of which was hauled 300 km by Henry Knox during the winter of 1775-1776, to Boston, to support the Siege of Boston. Well, that doesn't really suffice for this amazing feat of sheer daring & perseverance - which proved instrumental in turning the tide of the events during the American Revolution. Trying to imagine the scene when Henry Knox and others were carrying the heavy guns and cannons - on oxen and horses - across from Fort Ticonderoga to Albany to Boston in the dead of winter, crossing the Hudson river multiple times and the many hills of the Berkshire mountains, I was blown away by how much of a physical effort it must have been! In a matter of two months Henry Knox concocted this idea, got Washington's blessings in Cambridge, rode to New York City to arrange for supplies to be sent to Boston, traveled to Fort Ticonderoga, hauled these guns and cannons over to Boston and proved instrumental in shaping the course of the war! I wonder how many times an average guy have given up in this effort. I wonder if such an endeavor (of equivalent difficulty) will have any takers in today's world. I have added Three Cups of Tea: One Man's mission to Promote Peace... One School at a Time to my list of books to read in 2008. Greg Mortensen - the co-author of the book - is an inspirational figure who has started 50+ schools in remote & inaccessible parts of Pakistan & Afghanistan in the past decade through the Central Asia Institute organization. The first time you share tea with a Balti, you are a stranger. The second time, you are an honored guest. The third time you become family. Came across Bone Marrow donation for the first time on a Shelfari discussion post. The post was about inviting people to test for Bone Marrow tissue match for a seven year old Russian girl. Digging into the concepts further, I am now aware about how Bone Marrow donation works, and how it is helpful for a patient suffering from Leukemia. I am a registered donor on the National Marrow Donor Program. From a donor's perspective, it is a very simple procedure. After filling up a few forms (no, nothing about giving up my first born in those forms), I was asked to take four swabs of Q-tips and rub them against my cheek from inside my mouth on the four sides of my teeth - right upper, right lower, left upper & left lower. After I had rubbed each of them for about 10 seconds the volunteer took the swabs from me and placed them in a cover with my name on it. These swabs would be used to determine the type of my bone marrow tissue DNA. It is quite unlikely that my tissue would be a match for this Russian Girl. Tissue types are inherited, and hence patients are most likely to match someone of their own race or ethnicity. Very frequently it is likely there is a match within the family. Bone marrow stem cells will be made to move into the blood circulation through special medication (usually administered as daily injections over 3-4 days) and then these stem cells will be taken from the blood-stream. While a patient with Blood Cancer undergoes chemotherapy to destroy the cancerous cells, they also lose the healthy bone marrow tissue which is required to generate new blood cells. Bone Marrow Donation helps the patients to regain the lost tissue in a couple of weeks after the transplant procedure is done. Got to know about there being a deficiency of donors of various racial/ethnic backgrounds. There are stories on the web about patients from India/South Asia finding it difficult to find a matching donor. The stories of Pia Awal, Vinay, Raji Balachandran, Sonia Kumar, Gayatri Ramesh, Savita, and many other Indian / South Asian Cancer patients & the efforts from their friends and family to get a matching bone marrow donor for them should make it for an increased awareness among the people from the sub-continent, and help in more people being saved. In the coming months/years, I hope to see more such bone marrow drive events happening in the sub-continent.